The Public Policy Process is essential reading for anyone trying to understand the process by which public policy is made. Explaining clearly the importance of the relationship between theoretical and practical aspects of policy making, the book gives a thorough overview of the people and organisations involved in the process. Clear exploration, using many illustrations, of how policy is made and implemented. A new chapter on comparative theory and methods. New material on studying advocacy coalitions, policy changes, governance and evaluation. Part 1 - Policy Theories: Studying the Policy Process; Theories of power and the policy process; Rational choice theory; From pluralism to networks; Institutional theory; Comparative Policy Process Studies; Integrating theoretical approaches. Part 2 - Analysis of the Policy Process: Policy and politics; Agenda setting; Policy formulation; Implementation: an overview; Bureaucracy: organisational structures and processes; The policy process at the street level; The policy process in the age of governance; Conclusion: evaluation and accountability. Michael Hill is Emeritus Professor of Social Policy at the University of Newcastle, UK. Since leaving Newcastle he has held visiting appointments at London University, Goldsmiths College, Queen Mary College, the London School of Economics and Brighton University. Frédéric Varone is Professor of Political Science at the University of Geneva, Switzerland. He also taught policy analysis at the universities of Louvain, Belgium, and Lille, France, and was a visiting scholar at the University of California, Berkeley. 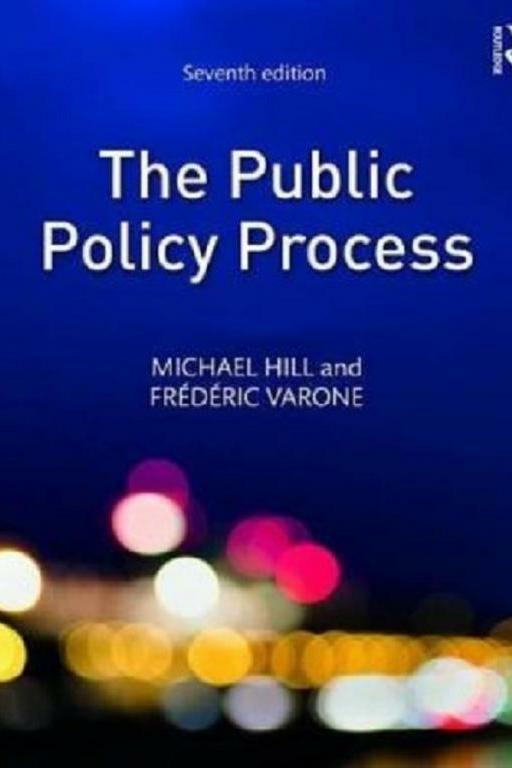 “In the 7th Edition of The Public Policy Process, Hill and Varone have transformed what has been one of the best introductory books on policy process research into one that is an even better. In doing so, they recognize and describe the complexities inherent in policy processes without reverting to overly simplified and distorted depictions. Based on crisp conceptualizations and comprehensive theoretical foundations, this book offers a firm foundation for new students and experienced scholars for understanding, studying, and influencing policy processes.” - Chris Weible, School of Public Affairs, University of Colorado Denver, USA. “The seventh edition consolidates The Public Policy Process is one of the leading textbooks in the field of public policy-making. It provides a rich and accessible overview of relevant theory and essential concepts along with illustrative examples from a diverse set of cases. The book is a great source of knowledge and inspiration that is certain to be of interest to academics and practitioners and all those interested in understanding the policy process.” - Daniel Nohrstedt, Uppsala University, Sweden. “This book presents an excellent contribution to the study of the policy process. Michael Hill and Frédéric Varone performed an invaluable service by authoring this new edition of the very successful textbook. It is a “must read” for students and researchers interested in policy theories ant their application to various aspects of the policy process.” - Sabine Kuhlmann, University of Potsdam, Germany. “A fresh edition of a classic textbook. It provides an even-handed, concise and considerate overview of a range of theories and approaches in the study of the policy process.” - Mark Bovens, Utrecht University, the Netherlands.